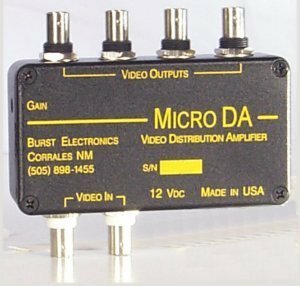 The four output MicroDA is a compact unit featuring a looping input. A wide bandwidth of 33 MHz assures clean video, Small enough to fit most anywhere but with no sacrifice in performance. Gain is adjustable plus or minus 3 dB. There is an internal jumper to select 75 Ohm termination, no need for an external terminator.